Hey ProductHunters! Get a 10% discount with the following promocode: PRODUCTHUNT10! React Native Starter is a mobile starter kit that allows your team to fully focus on development of the features that set your product apart from the competitors instead of building your app from scratch. React Native Starter is a part of a solution provided by Flatlogic. 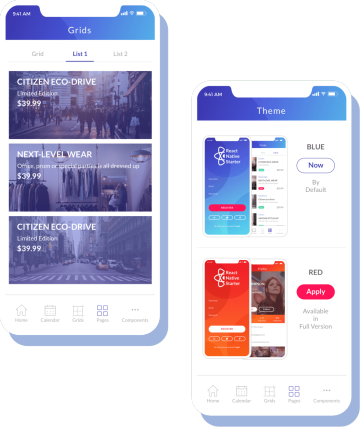 You can contact us if you are building your mobile application using React Native Starter and want to customize or integrate it with any service, back-end or REST API. React Native Starter offers countless possibilities for customization. It can be integrated with any service such as a CRM system, email system or website analytics program. What is more React Native Starter Kit can easily integrate with different content providers, including WordPress, YouTube, and Facebook. It can be integrated with your desktop theme. In general, it can be customized for a broad range of designs. Purchase Single Licence and get an access to the entire source code of the app with premium theme and all the screens and components. You'll be able to create a single app and publish it to any store! Purchase Extended Licence and get an access to the entire source code of the app with premium theme and all the screens and components. You'll be able to create a single app and publish it to any store! You simply need to sign up to get React Native Starter for free! Be first to know latest updates on our products and recent trends in React Native development.